45. A cracking first half of football; time for another! - Leicester City have been eliminated from all five of their previous League Cup meetings with Manchester City. - Manchester City have won each of their last five penalty shoot-outs in all competitions, after winning just four of their first seven. 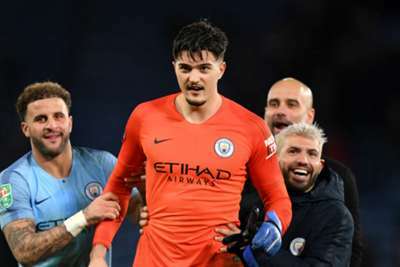 - Manchester City have failed to kept a clean sheet in each of their last seven games in all competitions, their longest run without a shutout since December 2016 (eight successive games). - Each of Kevin De Bruyne's last two goals for Manchester City have come from outside the box, although this was his first for 240 days (v Swansea).